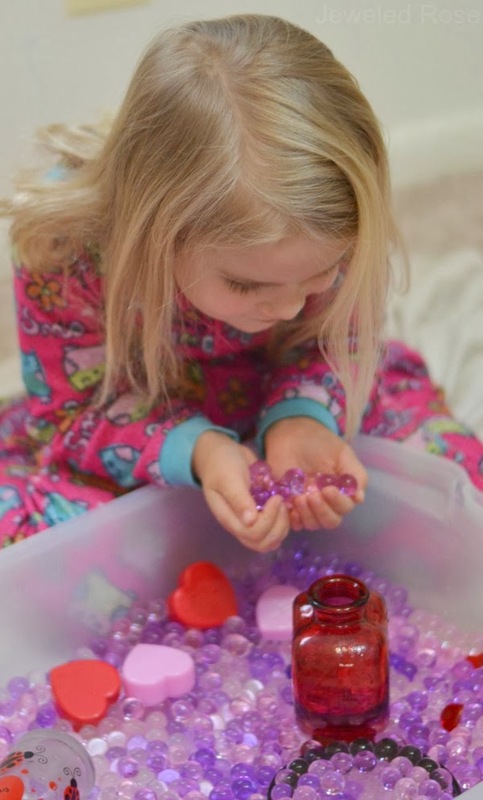 Have your little ones ever explored with water beads? They are so incredibly fun! My girls love them and even I can't keep my hands out of them when we make them. 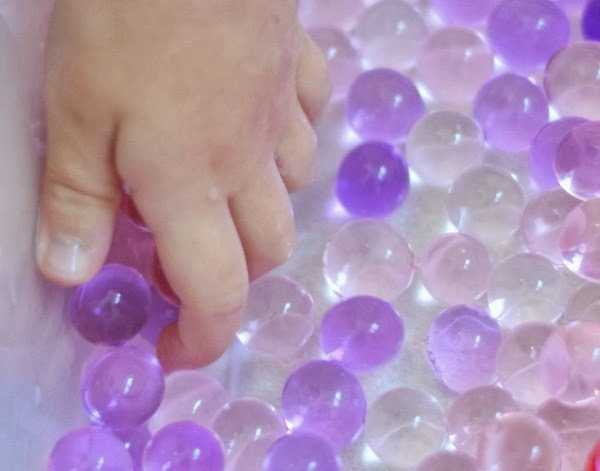 The other day we made a fresh batch of water beads and scented them for some super sensory FUN! This simple to create activity was lots of fun for Rosie and Jewel and kept them engaged throughout the morning. 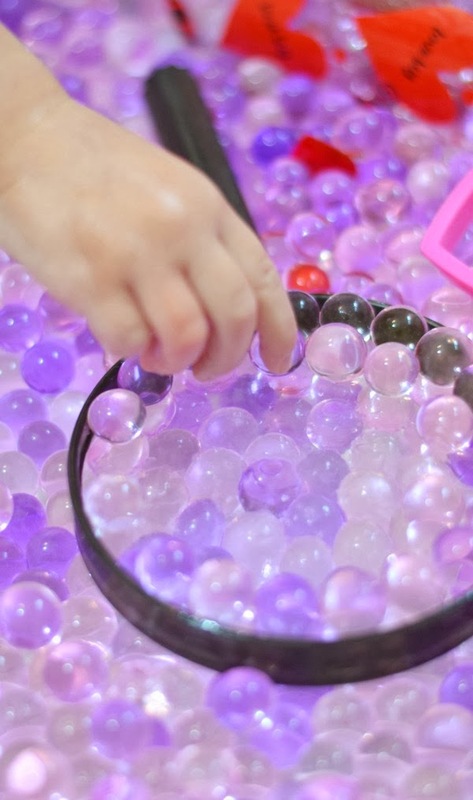 Water beads are water absorbing polymers that grow once they are placed in water. They are silky, squishy, and amazingly fun to play with. Water beads are most often used to hydrate plants or as colorful decorations. 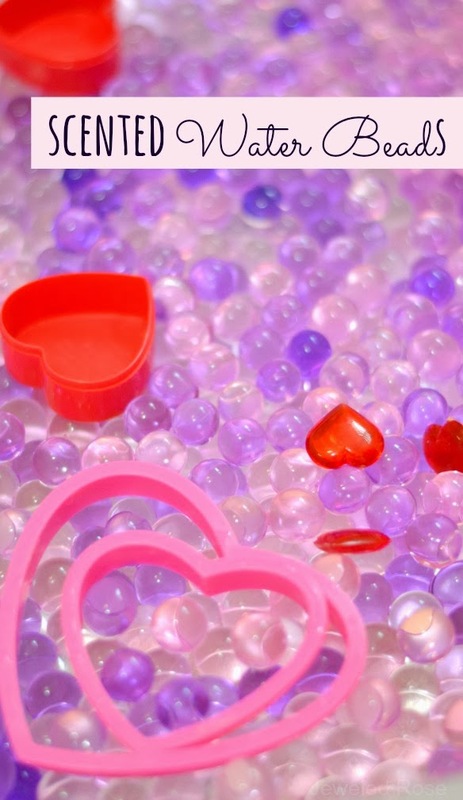 Water beads can be found in the floral section of stores like Walmart and Michaels. They can also be purchased online here and here. I am providing affiliate links for your convenience. With Valentine's Day fast approaching I decided to give our water bead play a valentines theme. 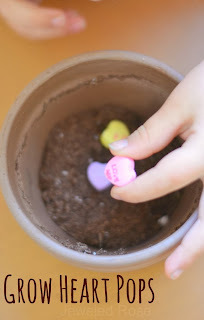 You could easily create a variety of themes by using different scents and different colored gems. Place the desired amount of water beads in a container of water along with a few drops of essential oil or extract. We used rose essential oil but have used other oils in the past. I would not use scents that would be tempting for children to eat. 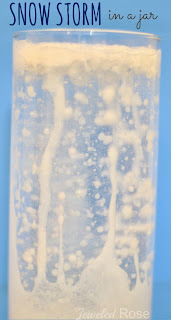 As the water beads fill with water you may need to add more water to the container. 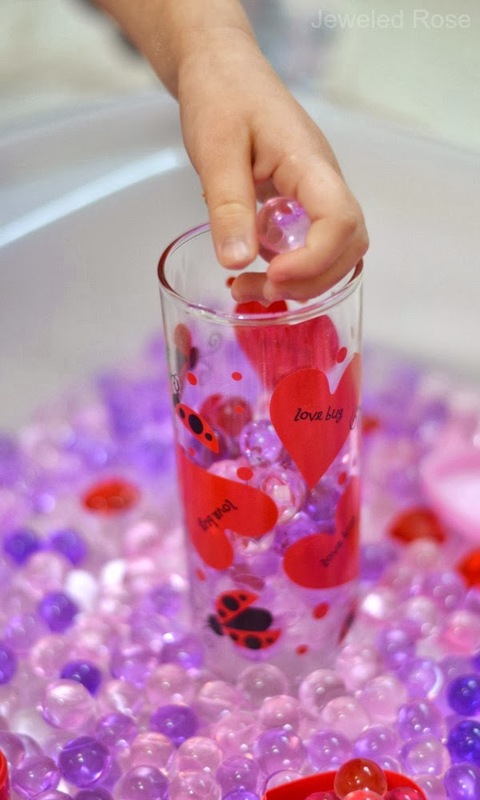 The water beads should be fully submerged while they are growing. In roughly 4-6 hours the water beads will be fully hydrated. Add scoopers, pourers, and other fun elements to the sensory bin and kids will have a blast playing and exploring with these amazing gems! Flashlights make a fun addition to water bead play as do glow sticks. Exploring on a light table is amazing, too! if you don't have a light table you can use magnifying glasses and flashlights to make mini light tables. My girls had lots of fun with those! A Few Tips: We usually keep our water beads for about a week. They can be kept longer and can even be washed between play times. If washing just place in a strainer and wash and rinse with soap. If the water beads are left out of water they will shrink.